Kalista has always been a hider, ever since we got her. 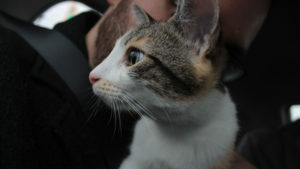 The first day we met her, she spent most of her time trying to scurry up my chest so she could hide behind me. The first we fostered her, she spent the majority of her time hiding under the bed or under any blankets she could find in our bedroom. 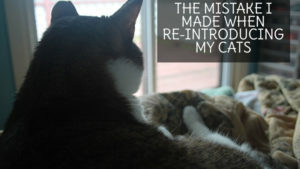 It was much different than the other two cats I’ve had, being Beau and Walker. Both Beau and Walker are happy to meet people. Walker being the extremely talkative kitty that he is, and Beau being the cuddly cat who wants back scratches and belly rubs as soon as you walk into the door. Although Beau, being a stray, was fairly skittish the first night I met him, he spent the majority of the night sleeping in my lap. Beau had a very quick warming up period, sleeping in my arms by the second night and every night thereafter. Walker also had a very quick initiation period. He was roaming around the house almost instantly and slept in my bed the first night. We thought things would be similar for Kalista (since she had already had a foster family before us) however we were very wrong. The first week of having Kalista, there were a bunch of times we thought we had lost her because she was hiding inside of her carrier, under the bed or inside of one of her many hiding spots she somehow discovered. Kalista used to climb to the top of our bookshelf to sleep at night just be inside of her carrier. For some reason, her carrier was a little safe haven for her and ended up being the subject of a number of my partner’s and my interactions. 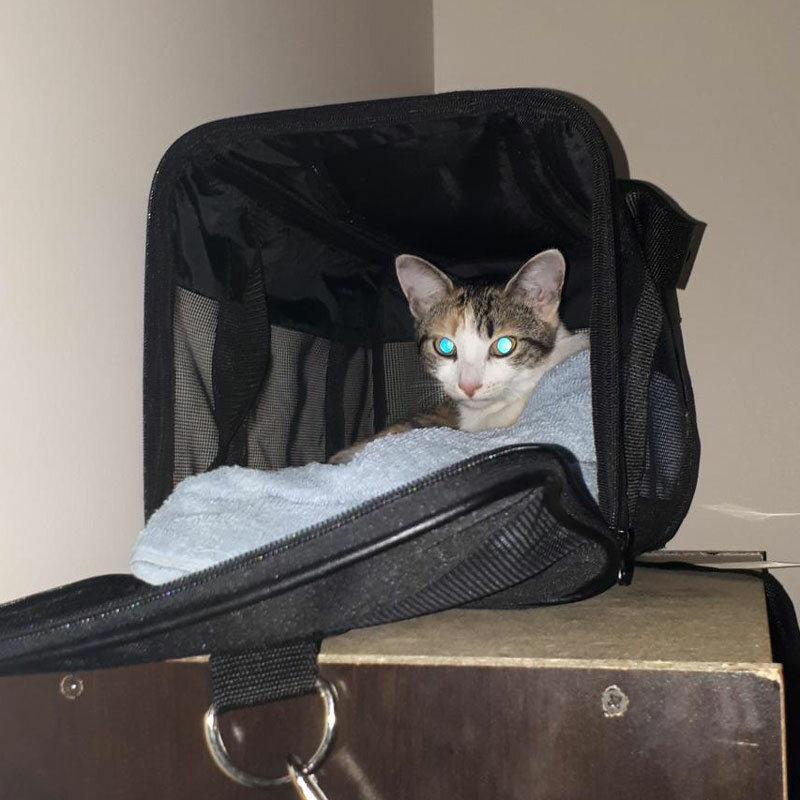 No, she was just sleeping inside of her favourite carrier. Kalista is actually the cat who you can find most frequently inside one of the Meowfia Beds, since they’re so warm and cozy, although I think her top pick is still her Amazon Basics Carrier which kind of surprises me since Beau’s still a hot mess when it comes to carriers. I will say though, Kalista has grown a lot. She’s no longer as scared as she used to be. 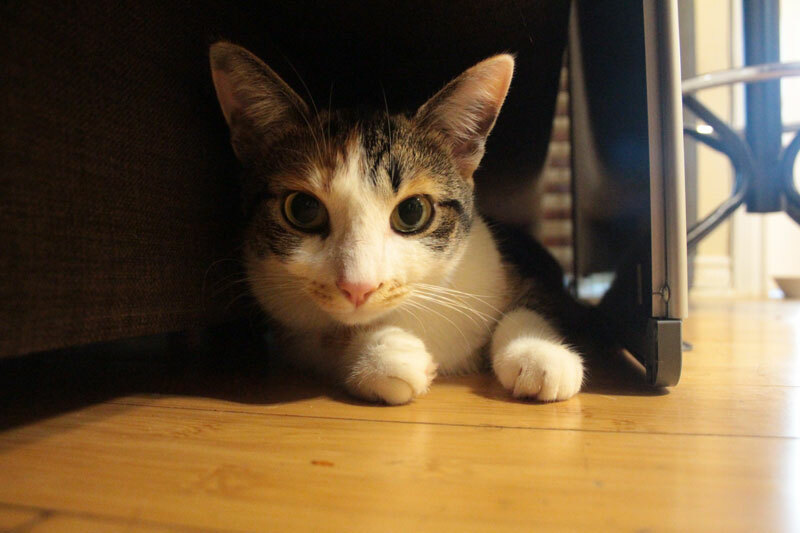 She’s coming out when people are around, but she still does a great deal of hiding. I am happy that she hasn’t been hiding as much, especially with my parents, since they’re over fairly frequently. I think the funniest thing about Kalista is the fact that she doesn’t necessarily care what she hides in, as long as there’s a lot of room inside of it. 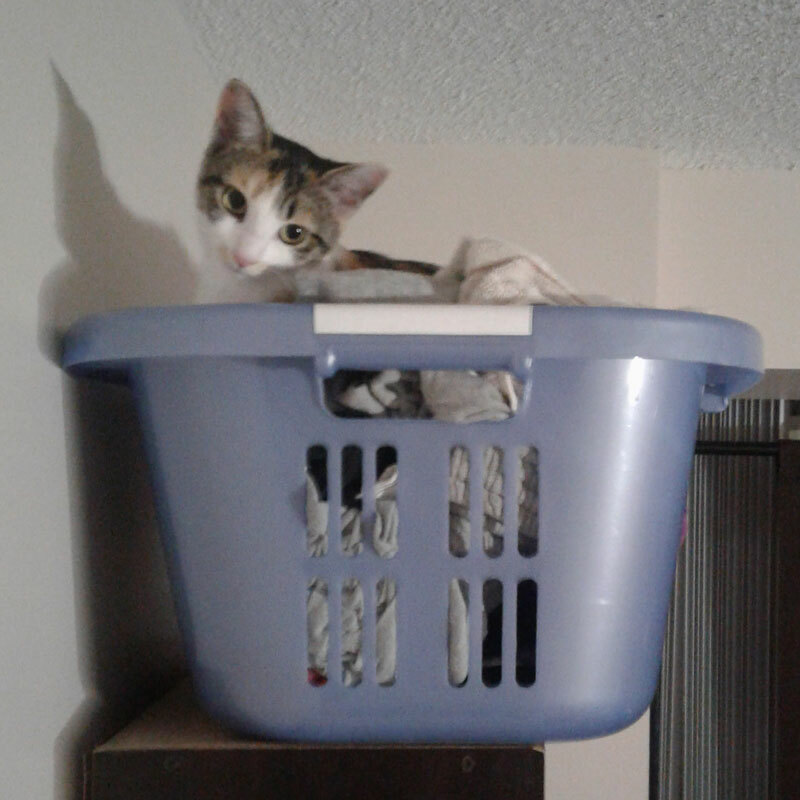 She’s been found inside of laundry baskets, inside of the couch, behind the whiteboard, inside of drawers, behind my desk… the list goes on and on! Look at that face she’s giving us as she’s sitting inside of our laundry. What a cat she is! How about you? Any of you pet parents to any hiders? Do they hide as much as Kalista, or is she a special case? Let me know in the comments below! 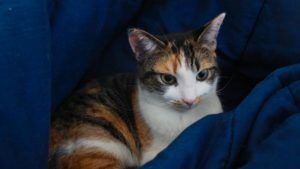 This is just a wonderful post on Kalista and her favorite spots to hide. She is just too adorable. We guess that sometimes it can be scary if you don’t know where she is at. We are going to see about getting one of those Meowfia beds. Our little ones at home aren’t hiding unless the vacuum comes out. Thanks for the wonderful share. Have a great day. No problem for the post, thanks for checking it out! The meowfia beds are definitely worth an investment. 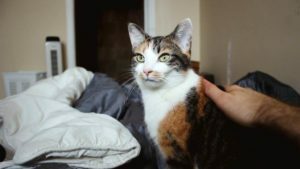 At first I was uncertain our cats would even look at them, but you can tell they are going to love them all year round, especially the winter. Hahaha! It’s kind of crazy where they will hide and honestly, it’s the hardest to find them when they’re in plain sight because you don’t expect it! That is a cute story about Kalista’s hiding spots. Cats love finding new spots to sleep and hide. For sure! I have loads more pictures coming soon of the places she’s found!